Samuel Cooper (1609-1672) was the most famous miniature painter of his age. He was born in London in1609. He learned miniature painting from his uncle, John Hoskins, who lived and worked in Bedford Square and was himself an eminent miniaturist. Cooper’s style seems to descend directly from that of Nicolas Hilliard via Larkin and Hoskins. Horace Walpole states that Cooper was influenced by Van Dyke but was an original genius. Cooper went into business on his own in 1642. He worked successfully through the period of the Commonwealth and included many of the leading puritans amongst his clientele. Because of his established reputation he quickly received the patronage of King Charles II upon the king’s restoration. Cooper’s reputation at the pinnacle of his profession reached its summit in1663 when he was appointed the king’s limner. Cooper lived for many years in the up-market locality of Henrietta Street, Covent Garden. His friend Samuel Pepys makes reference to him in his diary where he calls him “the great limner in little’. His paintings of 17th century worthies are many and legendary. He appears to have painted Oliver Cromwell a number of times along with Prince Rupert, Charles II, James II, General Monck, the poet John Milton etc. 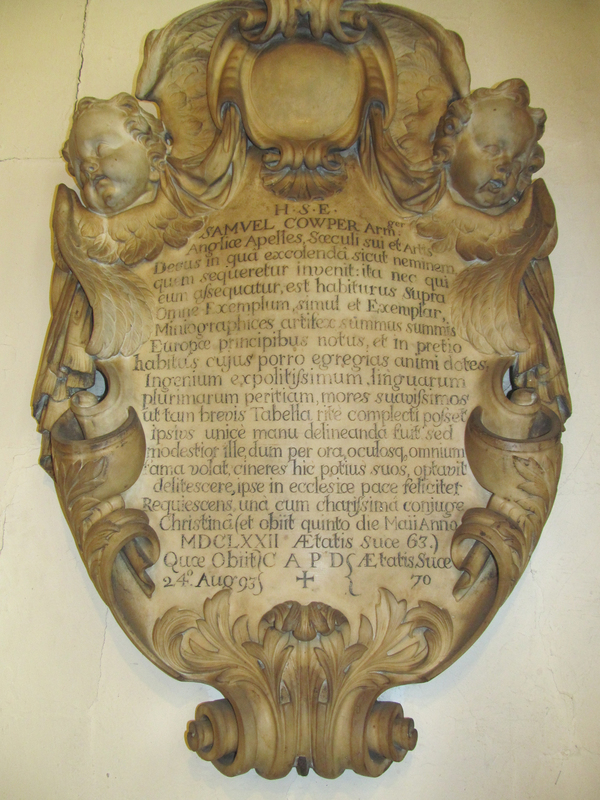 He died in London on 5th May 1672 at the age of 63, and was buried in St. Pancras Old Church where there is a monument to his memory on the east wall of the chancel.